A 64-year-old teacher jailed after a fight with a 14-year-old student in a classroom at an alternative high school in Maywood was released from custody Saturday. Video showed Riley slugging it out with the student as other students and a woman wearing a yellow safety vest try to intervene. Some students could be seen recording the fight on their cellphones. School police relayed information about what happened to the deputies and Riley was arrested and taken to the sheriff's station for booking on suspicion of committing cruelty against a child. He was booked there on $50,000 bail, officials said. He was released at 7:46 a.m., according to the sheriff's Inmate Information Center. Deputies from the sheriff's East Los Angeles Station responded to the school after being called by the principal, the sheriff's department reported. The student was not seriously injured, but was taken to a hospital where he was treated and released, the sheriff's department said. The LAUSD released the following statement Saturday: "We are extremely disturbed by the reports of the events that occurred at Maywood Academy High School. We take this matter very seriously and do not condone violence or intolerance of any kind. 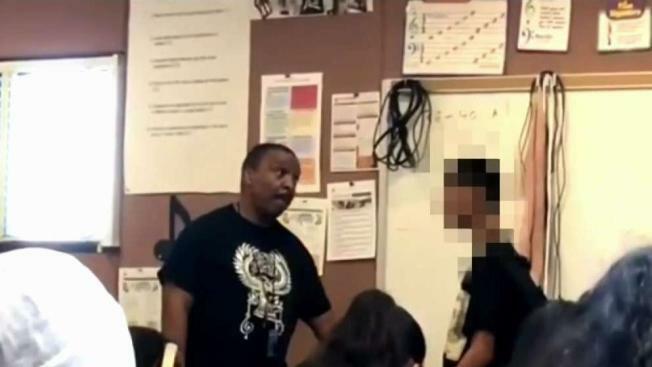 Los Angeles Unified is cooperating with law enforcement in investigating this incident. Crisis counselors and additional School Police patrols will be at the school on Monday to support our students and staff."